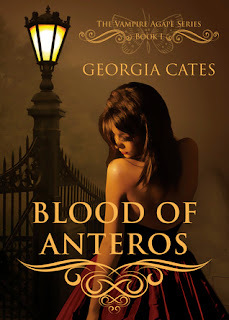 Good Choice Reading: Excerpt & Giveaway of Blood of Anteros by Georgia Cates! Excerpt & Giveaway of Blood of Anteros by Georgia Cates! She rose up onto her tiptoes and planted a kiss on my cheek before she released her hold of me. I reluctantly released my hold as well, but I wasn’t finished exploring this. I wanted more, I needed more. The paradox of her words brought a smile to my face. She saw a life saver in a skilled killer and I was tantalized by mystery of her. The leech inside me came out to find prey, but found none in this enigmatic girl. The proximity of her essence didn’t entice him, so what did that make her? I had more questions than answers, but one thing was unmistakable; although she released me from her embrace, her hold on me remained. I was uncertain what this meant for me, but more importantly, I didn’t know what it meant for Chansey. Of all the puzzling things in my head, there remained one clear circumstance; she needed my protection because, for once, I wasn’t the dangerous one. I tried, unsuccessfully, to stop imagining the things he had planned for her. He wasn’t here tonight for spying. He was here to take her and I knew he had played the precise details over and over in his dark mind. He intended on grabbing her between the car and the house. He knew every detail, down to exactly how he would keep her quiet and where he would take her, along with the route to get her there. This was his first attempt, but it wouldn’t be his last. He would revise his plan, but he wasn’t the only one making plans and mine didn’t involve anything forensics would explain. This was a delicate matter, and if I didn’t intervene, it could be too late by the time the authorities were forced to pursue him. They needed evidence and proof, while I did not. I saw his intent and it was enough for me as the judge and jury. Judge Daddy wasn’t going to get him out of this one because I would be ready for him when he returned. As I heard the words my tongue released, I only thought of Chansey and her compromised safety provoked my heart to declare responsibility of her. Faster than the blink of an eye, and it was done. I declared a vow, a sacred vow, to always protect her and allow no harm to come to her by my hand or the hand of another. Georgia Cates is giving away a copy of Blood of Anteros (bk 1) and Blood Jewel (bk 2)! Really enjoyed the excerpt. I may have to check this book out. Definitely intrigued. Liked the excerpt too. Thank you. I haven't really heard much at all about this book. But the excerpt seems incredible! I can't wait to read it. I really like the cover and it makes me curious about the story. This book sounds really good, I'd love to read it. Thanks for the giveaway! It sounds really good! Thanks for sharing the excerpt us and for the chance to win! Thank you for the excerpt, and now I really need to read this book! I barely bought it the other day for my kindle :). What a great sounding book. I cant wait to read it. Thanks for the giveaway! Great excerpt. Hope to get my hands on this soon!